The hunt for six-pack abs can be a frustrating one. Men often try to achieve V-cut definition in their stomach by working on their lower abdominal muscle. This muscle, consisting of the lower portion of the rectus abdominis, can be tricky to isolate. Fortunately, a 2001 study published in the "Journal of Strength and Conditioning Research," as well as a 2010 study published in the "Journal of Orthopaedic and Sports Physical Therapy," both identified some of the top exercises for men focused on strengthening their lower abs. 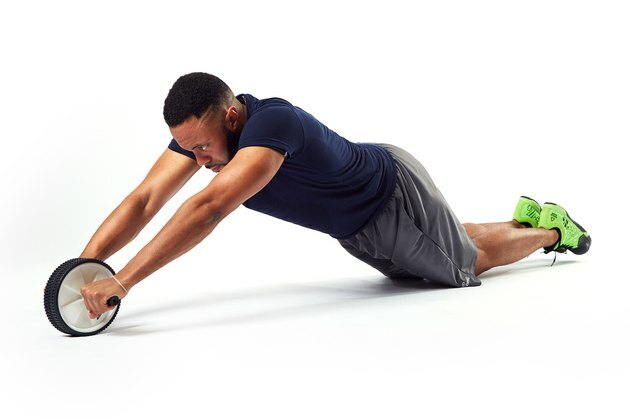 HOW TO DO IT: Begin in a push-up position with your lower legs supported on a Swiss ball. Your spine should remain flat and your abdominal muscles should be engaged. Flex your hips and raise your buttocks in the air while keeping your knees completely straight. As the ball rolls forward, the trunk flexes and the lower rectus abdominis is activated. Continue this movement until only your feet remain on the ball. Hold your buttocks in the air for 1 to 2 seconds and then slowly return to the starting position. HOW TO DO IT: Kneel with an erect trunk and with your arms resting on a Swiss ball placed 8 to 12 inches in front of you. Roll the Swiss ball forward and assume a plank position with your forearms resting on the ball for support. Maintain a neutral spine and keep your buttocks in line with your body. Do not hold your breath or rest your chest on the ball. Maintaining this position on an unsteady ball challenges the lower abdominal muscles. Hold this position for 5 to 10 seconds and then slowly return to the starting position. HOW TO DO THEM: This exercise uses the same starting position as the pike, assuming a push-up position with the lower legs resting on a Swiss ball. With the abs engaged and the spine remaining flat, slowly raise one leg up towards the ceiling while making sure the ball does not move. Do not bend the knee when raising your leg. The instability created by the ball encourages the abs to activate and to maintain the steady position. Hold this leg in the air for 1 to 2 seconds and then slowly lower it back to the ball. Repeat by lifting the alternate leg. HOW TO DO IT: Lie on your back with your knees bent and your arms elevated over your head. Lift both knees toward your chest and simultaneously bring your extended arms toward your knees. Keep your knees bent and your arms extended throughout this motion. Once your knees and arms meet, hold this position for 1 to 2 seconds before slowly lowering the arms and the legs back to the starting position. By flexing your trunk and then slowly releasing it, the lower abdominals are effectively targeted. Lie on your back with your arms at your side and your head lifted slightly off the floor. Lift your legs in the air so that your knees and hips are each bent to 90 degrees, as though you were sitting on an overturned chair. Slowly bring your knees toward your chin until your lower back lifts slightly off the mat. As this motion occurs, the trunk bends slightly forward and the lower portion of the rectus abdominis is isolated. Hold this position for 1 to 2 seconds and then lower your legs back to the starting position. To build strength in the lower abs, perform 2 to 3 sets of 10 repetitions of each exercise at least two to three times a week, according to the ACSM. Any strengthening regimen should be balanced with exercises targeting the other abdominal muscles. In addition, none of the exercises should be painful to perform.